The Shnuggle Air, the only bedside crib-to-cot from birth to beyond, launches on March 4thand you can win one. When looking for a first bed option for your new baby, we understand that safety, closeness and comfort are of paramount importance. You may have looked further down the line and considered cot and cot bed choices in order to get the nursery ready for when baby moves into their own room. In reality, baby is still so little when crib-to-cot transfer is made, and this can be unsettling. It can feel like your precious tiny baby has moved from a snug, safe sleeper in close proximity to a big sleeping space all on their own – and we know this can feel like it is miles away. We know, having spoken to lots of parents and parents to be that there is huge awareness around materials used, breathability and overall safety of sleep products for their baby and these needs are very much present until baby is around 2 years old. With this in mind, we set about creating a unique sleep product for baby which focuses on safety, breathability and longevity that offers the design benefits parents are asking us for. 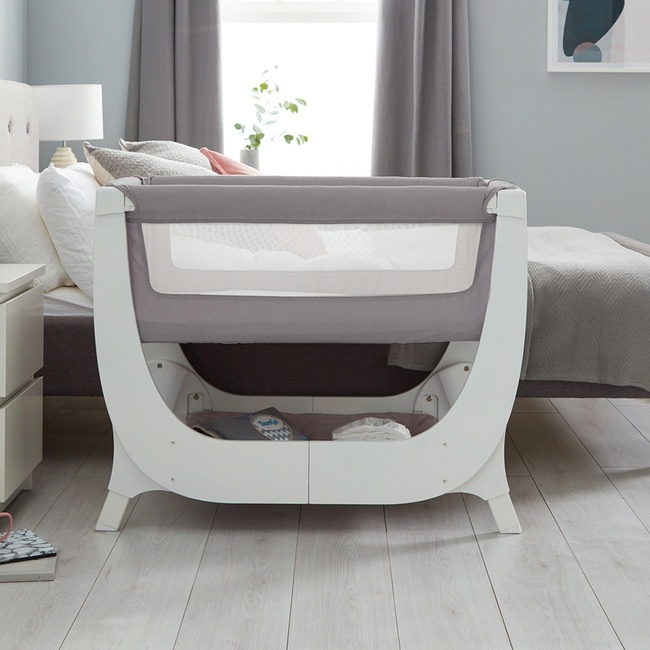 Combining all the key features of baby’s first bed to provide a safe, close and cosy sleep space from birth, the Shnuggle Air is uniquely designed to grow with your baby; converting to a stylish cot and extending the safety and comfort right up until he is she is approximately 2 years of age. Designed with breathability at its core, the dual view, mesh sides help to maximise airflow as well as allowing you to keep a watchful eye on your baby. Extremely versatile, The Shnuggle Air has 7 height adjustments to fit most bed heights and attaches securely and easily to most standard bed frames. The uniquely designed airflow mattress has a hypo-allergenic fibre core which is 50%* more breathable than standard foam mattresses, helping to reduce the risk of overheating. The Shnuggle Air also uses baby safe, hypo-allergenic fabrics which can all be completely removed and handwashed. As well as helping to maximise breathability, the Shnuggle Air features a gentle incline option to help ease colic and reflux as well as a zip down side to easily feed or comfort your baby during the night. The storage hammock underneath provides a super handy storage space for those night-time feeding and changing essentials too! 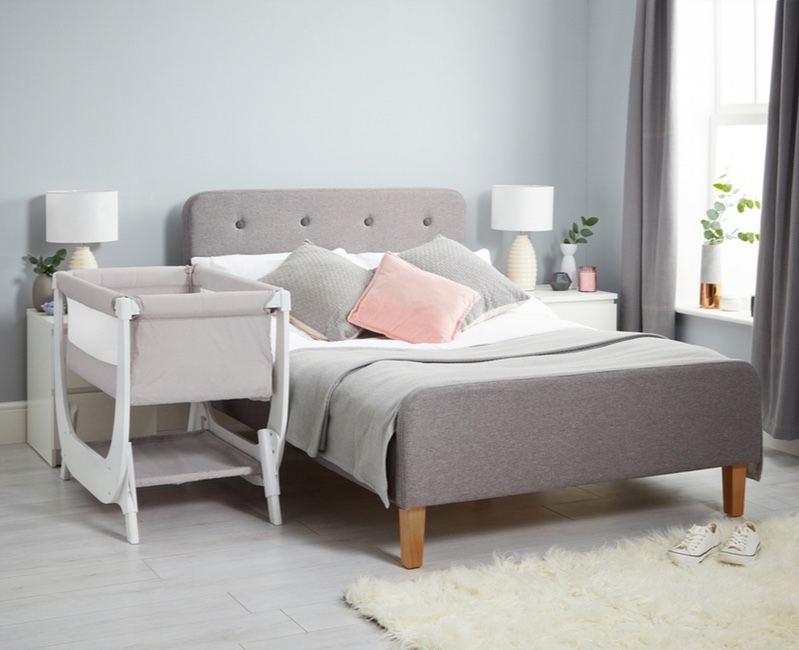 In a choice of two beautifully neutral fabric colours – Dove Grey and Stone Grey – the Shnuggle Air is easy to assemble and can be used as a bedside crib or standalone. 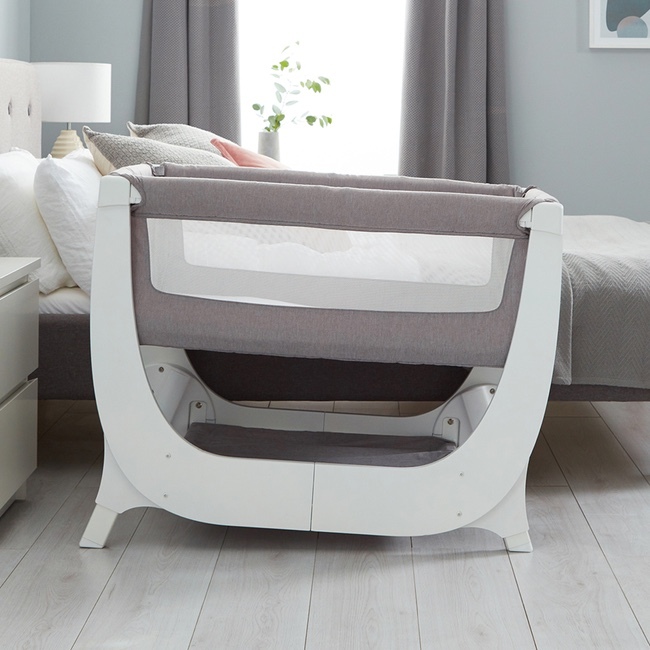 The Shnuggle Air Cot Extension Kit easily extends the crib by adding a few frame extensions, larger bed base and fabrics. Add the Shnuggle Air Cot – Airflow Mattress (sold separately) to complete your baby’s new cot. We are proud to lead the way in making baby’s first years a safe, relaxing and fun experience and the Shnuggle Air is a true indication of our passion, dedication and care in making family life that little bit easier. We are really proud of the Shnuggle Air and can’t wait to see lots of pictures of cosy babies sleeping soundly. We hope you love it as much as we do and we are offering one lucky reader the chance to win a complete Air system, worth £320. All you have to do is register to win. The Shnuggle Air Bedside Crib has an SRP of £199.95, with the Shnuggle Air Complete Sleep System at SRP £320. Available to pre-order from February 4that www.shnuggle.com and instore from March 4that John Lewis Partnerships. How long does the average toddler take to fall asleep? Is your toddler ready to move our of their cot?